It was around the mid 2004 when Tomas Olsson and Fredrik Bergh decided to team up with Urban Breed and Oskar Belin to search their musical roots by forming a band that was lately named BLOODBOUND. This line up released in the early 2006 the album entitled Nosferatu that received some pretty flattering reviews. The album's appealing to the metalheads took the band on tour where the shared the stage with bands like ARCH ENEMY, DARK TRANQUILLITY, EVERGREY and PRETTY MAIDS to name a few. Several line up changes took place during and after the tour, eventually leading the band through some difficult times making the future looking uncertain. Fortunately, BLOODBOUND survived and started working on the second full length release. The line up was truly solidified when the proper replacement was found, to take the sheat behind the microphone, in the face of Michael Bormann (JADED HEART, BONFIRE). So, the CD promo reached the Metal Temple headquarters waiting to prove its worth as the ancestor of the very good debut Nosferatu. For those who are unfamiliar to the band it must be cleared out from the start that they play something between old-school Heavy Metal and German Power Metal keeping a safe distance form all the nu-metal or core music genres. The keyboard intro of Sign Of The Devil and the catchy guitar riff outline the classical education of the five piece band. The melodic chorus of The Tempter and Mr. Bormann's harsh yet powerful voice reminds of bands like KROKUS or even DEMON. The German band SINNER comes in mind as soon as the groovy and sin-along chorus of Book Of The Dead comes through the speakers. By now it has become clear enough that the album comes with a wonderful sound production and mix reproducing the 80s atmosphere that surround the 11 tracks of the album. Among them you'll find faster songs like the guitar driven Bless The Unholy the galloping Flames or the almost Power Metal track Turn To Stone. Black Heart is the classic metal ballad where Bormann changes pitch at ease perfectly following the music pattern. The highlight of the album is the 7 minutes long Seven Angels that kicks in with an IRON MAIDEN bass guitar intro and slowly transforms into an uplifting Power Metal track with melodic guitar riffs from the early HELLOWEEN era. 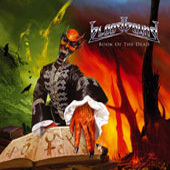 Although it's nothing groundbreaking BLOODBOUND's second discographic move can be considered as the continuation of Nosferatu with some very well played Power Metal that will satisfy even the die hard fans.